Opera Rara continues its exploration of smaller scale French operas with a new recording of Gounod's opera comique La Colombe. 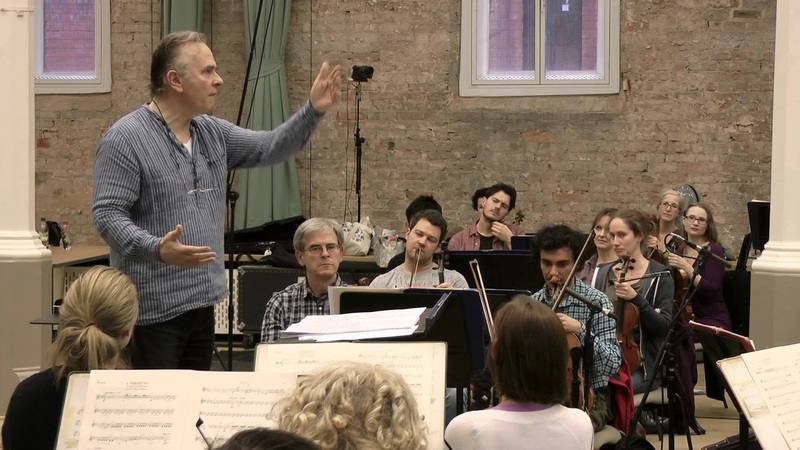 The cast features Erin Morley, Javier Camarena (who we saw last year at a Rosenblatt Recital), Michele Losier and Laurent Naouri with Sir Mark Elder conducting the Halle. La Colombe is one of a group of smaller scale works with spoken dialogue which Gounod wrote in the late 1850's. The works all belong to the opera comique genre even though they were not performed at the Opera Comique itself. Two (Le Medecin malgre lui and Philemon et Baucis) were written for Leon Carvalho's Theatre Lyrique where, between the two Faust was premiered as well. The third of the group, La Colombe was premiered in Baden Baden. Carvalho's wife was a lyric coloratura soprano so it helped if composers wrote parts for her in their operas, which Gounod naturally did, and in fact she sang the role of Sylvie in La Colombe in Baden Baden. By this date Gounod had already had two works performed at the Paris Opera (Sapho and La nonne sanglante), neither of which was a success and it is in the smaller scale works that Gounod's melodic gifts were able to flower. La Colombe is still relatively unknown in Gounod's repertoire, but those readers who follow the Buxton Festival will certainly be aware of it as the opera has been performed there twice (see my review of the 2013 production). The plot is pretty slim. Horace (tenor, Javier Camarena) has spent all his money on a young lady, Sylvie (soprano Erin Morley) who does not love him. Now destitute he lives in the country with his manservant Mazet (mezzo-soprano Michele Losier). Sylvie comes to visit with her majordomo (baritone Laurent Naouri) and is in fact seeking to get Horace's tame dove (because one of her rivals has a talking parrot). She invites herself to dinner. As there is no food, Horace decides that the dove must be sacrificed and Sylvie realises that he still loves her. All ends happily especially as Mazet reveals that it wasn't the dove at all but the hated rival's parrot which they ate. 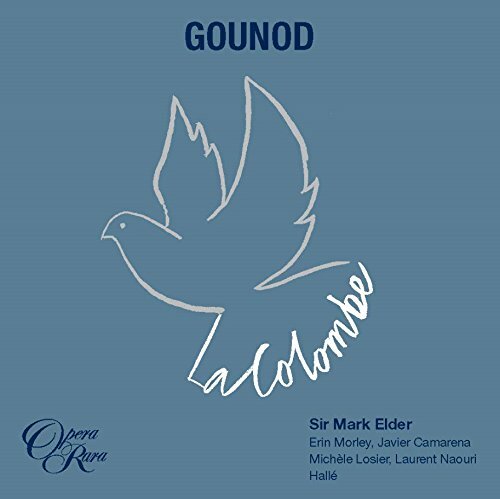 Gounod treats all this with a light touch and Mark Elder and his cast respond to the music with a similar combination of deft lightness, and sheer delight. Gounod's gives each of the four soloists a moment or two of solo spotlight, but it is as much for the ensembles as the solos that the works charm comes. We start with an orchestral Introduction which almost hints at Offenbach before giving us a lovely singing cello melody. Erin Morley is certainly appealing as Sylvie the rather demanding young lady. There is a certain tremulous quality to Morley's voice which works well in this repertoire and she is definitely adept as all the twiddly bits, but is also nicely affecting in her second act solo. Javier Camarena makes as fine Horace, singing with a lovely sweet, narrow tone which suits the role well. He is a very stylish singer and would seem quite a find in this repertoire, making his Romance in Act One appealingly poetic and giving us a lovely lyric solo in Act Two. Horace's servant Mazet, the travesty role, is played with great zest by Michele Losier. Her couplets at the opening of Act One are charming, sung with a warm vibrato and shapely sense of phrase. But her diatribe against women at the end of the act is a terrific tour de force. Laurent Naouri is a great delight as the grumpy Maitre Jean, singing with a lovely sense of character and you feel that he is having great fun. As I have said, the various duets, terzetto and quartets make the whole thing a delight and the entire performance zips along with great fun (it is after all a farce, albeit one with a heart). Mark Elder (music director of the Halle and artistic director of Opera Rara) and the Halle bring a deftness of touch to the music along with the requisite pin-sharp playing which makes me look forward to further Opera Rara discs from this ensemble. The opera is performed in French with French dialogue (French coach Nicole Tibbels, repetiteur Jeff Cohen), including some melodrama, and both the spoken and sung French is done with a creditable sense of style (it probably helped having a Frenchman and a French Canadian in the cast!). The Cd booklet comes complete with the full sung text and dialogue, plus the usual extensive articles and historic pictures that we expect from any Opera Rara production. This set makes a lovely follow up to Opera Rara's account of Offenbach's charming and neglected Fantasio and I do hope that we will be able to look forward to more French rarities. Opera Rara's latest project debuted on Friday 28 November, with a concert performance of Leoncavallo's Zaza, see my review.